I've been collecting Neal Asher novels for ages however until now I've not had chance to read much of his work. Luckily Dark Intelligence has been sent in for review and so I've finally had chance to discover the delight that is the Polity Universe. Dark Intelligence is all about transformation. Physical transformations such as the one that Isobel Satomi has begun following Penny Royal's intervention. Then there is the resurrection of Thorvald Spear following his death a century earlier in a war against aliens. That rogue malevolent AI Penny Royal is looking for a different transformation, that of redemption. He is of course the Dark Intelligence of the title and his escapades form the main plot (to be continued in the next book). The book is written from a number of perspectives, all somehow linked to Penny Royal and there are a good number of twists, turns and unexpected surprises. 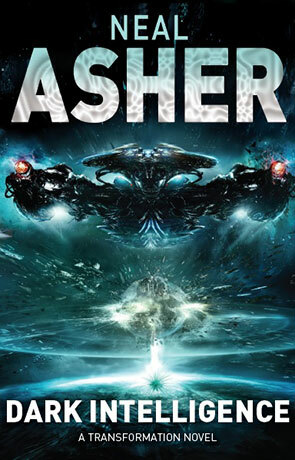 I love the feel of Asher's universe, it is a wonderfully rich and mature stage on which to set this thought-provoking space opera. Its a very modern futuristic style, lots merging of the biological and artificial. The different perspectives work well, especially that of Isobel as she goes through a transformation that changes her beyond recognition. There seems to be lots of reference to the authors previous stories and those who have read his work before should appreciate these bits, it doesn't detract too much as a virgin Asher reader but it does make you feel like you are missing out on something. Overall Dark Intelligence is an imaginative, epic space opera this manages present a dark future universe full of vibrant spaceships, people, creatures and intelligence. Highly enjoyable and highly addictive, Asher has a new fan. Written on 30th March 2015 by Ant.